DETROIT -- Buick, the storied General Motors brand that had been staging a strong comeback since barely surviving GM's 2009 restructuring, has hit a pothole. Buick sales have dropped for seven straight months, tied with Cadillac for the longest losing streak among the 41 brands sold in the United States. But unlike Cadillac, which has two new nameplates coming this summer, Buick doesn't have new or redesigned vehicles riding to the rescue. The question confronting Buick is whether the slump is a sign of deeper troubles or simply growing pains now that GM finally has gotten serious about positioning Buick to challenge entry-luxury brands such as Acura and Infiniti. Much of Buick's lost sales momentum is self-inflicted, as GM takes steps to polish the brand's image and raise residual values. For example, GM has dialed back Buick sales to rental-car companies, a practice that for years has eroded the brand's value. Buick sales to fleet customers -- the vast majority of which are rental-car companies -- were down by two-thirds in the first four months of 2012 from year-earlier levels. The scale-back marks a major strategic shift for Buick, which historically has relied on rental-fleet sales to move the metal. In the pre-recession and pre-bankruptcy year of 2007, for example, fleet sales accounted for around 15 percent of Buick's sales. This year, through April, they were 7 percent, a GM spokesman says. Buick also has scaled back on consumer incentives -- another step that erodes sales in the short term -- in the hope that it will pay dividends down the road in the form of a better image and higher prices. Through April, Buick's incentive spending fell to 10.1 percent of its average transaction price per vehicle, from 11.5 percent in the same period last year, TrueCar.com data show. At the same time, Buick is working to make its leases more competitive. Dealers say that's crucial if Buick wants to compete in the entry luxury space, where lease penetration tops 50 percent for some brands. GM executives say getting Buick's long-term positioning right trumps any concerns over short-term sales numbers. "We're taking a very disciplined approach to the Buick brand," says Brian Sweeney, vice president of sales and service for Buick-GMC. "We're building a good house, a good foundation." While the percentage drop in fleet sales is deep into the double digits, retail sales haven't been great either. Retail sales are down 5 percent through April. Add in fleet sales, and Buick's total sales in the first four months came to 52,782, down 16 percent. In contrast, GMC's sales rose 2 percent to 124,487. Most Buick dealers also sell the GMC truck brand. As recently as last fall, brisk demand for Buick's Enclave large crossover and Regal sedan were helping the brand to 24 straight months of sales gains, one of the industry's longest runs. For all of 2011, Buick sales rose 14 percent, after soaring 52 percent in 2010. But demand for the Regal and Enclave has sagged. 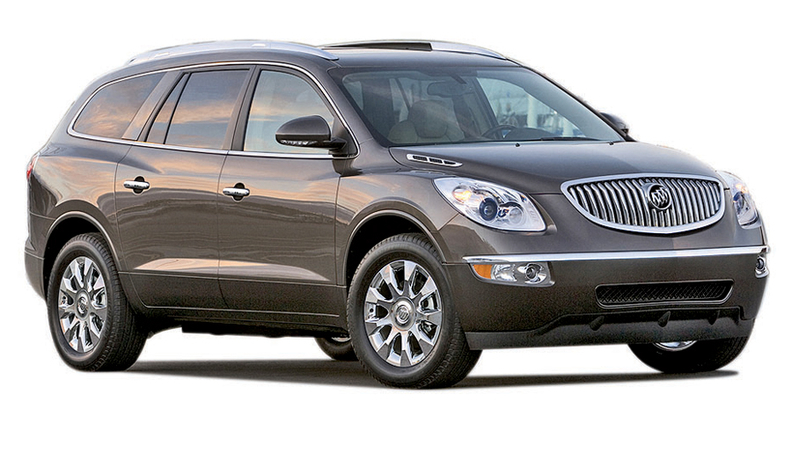 The Enclave gets reskinned for the 2013 model year, while the Regal, which was launched in late 2009, likely won't get any significant enhancements for two years. GM executives and many Buick dealers are confident that the recent decline is simply a lull. Both groups rave that the growing lineup of sedans and crossovers is vastly improved over just a few years ago -- a view supported by sharply higher residual values and solid product reviews. Last year Buick vehicles on average were expected to retain 46 percent of their value after 36 months, up from 39 percent in 2008, according to data from ALG. The residual on the Buick Verano is 48 percent, equal to that of an Audi A3 and competitive with other cars in ALG's premium compact segment, including the Volvo C30 and Lexus CT 200h, each of which is projected to hold 49 percent of its value after 36 months. GM also is pushing for better service from its leaner Buick-GMC dealer network, which has shrunk to 2,121 franchises last year, from 2,705 at the start of 2008. Buick-GMC dealers are rolling out a courtesy loaner program for service customers. Buick dealers' customer satisfaction scores already are among the industry's highest, ranking No. 2 out of 21 mass-market brands in the 2012 J.D. Power and Associates Customer Service Index Study. "The dealers who are engaged and buying into the direction of the brand are having major success," says Mike Bowsher, who owns two Buick-GMC stores in the Atlanta area and one in Orlando. The 109-year-old Buick brand was saved from the chopping block during GM's restructuring because of its strong sales in China, the world's largest auto market. Selling virtually the same vehicles across continents drives down development costs. Last year Buick was the No. 5 brand in China, selling 645,829 units -- nearly four times as many as it sells in the United States. While it's the smallest of GM's four brands in the United States, Buick helps GM attract new buyers: Forty-one percent of Buick buyers in 2011 came from non-GM brands, up from 29 percent in 2007, GM says. Bowsher, co-chairman of the Buick-GMC National Dealer Council, is among many dealers surprised by Buick's lost momentum. He says his stores' Buick sales were up 46 percent for the year through April. In addition to the drop in fleet sales, GM managers point to the recent phasing out of the aging Buick Lucerne. But those lost units largely have been offset by the new Buick Verano, the brand's first small car since the early 1990s, which was launched in December. Swapping those cars should help Buick's nagging image as a retirees' brand. With its four-speed transmission and cavernous trunk, the Lucerne was the final holdout of old-school Buick. The Verano, which is based on the Opel Astra, is aimed at younger buyers looking for their first taste of luxury. A stodgy image still clings to the brand even as Buick rolls out European-derived cars with sleek, taut designs such as the Regal, which is a cousin of the Opel Insignia. It is built in Osh-awa, Ontario. In its April car-buying issue, Consumer Reports rated the Regal higher than the Volvo S60 and Audi A4 among compact sport sedans. The Enclave ranked sixth out of 22 luxury SUVs. Both got low marks for reliability, though, which is a nagging problem, according to the magazine. "I fight the good fight every day about perception," says Steve Cappellino, a Buick-GMC dealer near Buffalo, N.Y. "I'll tell someone I'm a Buick dealer and they'll say, 'Oh, my dad owned one,' or, 'My grandfather had three.'" Despite GM's efforts to position Buick against import luxury brands such as Acura and Infiniti, research shows that consumers lump Buick with brands such as Ford and Toyota. In April, those were the two most-shopped brands by consumers who also were considering a Buick, according to Edmunds.com. Cappellino echoes the sentiment of many Buick dealers: The trick is persuading would-be buyers to get behind the wheel to dispel the old-fogey image. They hope a new lease program will help. In March, GM rolled out a 24-month lease deal, dubbed Experience Buick, that includes routine maintenance, satellite radio and OnStar. Since then, Cappellino says showroom traffic has been the strongest of the year. But it hasn't yet reversed Buick's monthly sales declines. Sweeney says the program has helped push Buick's nationwide lease penetration up to 30 percent. He expects it to climb even higher. Until the new lease plan, Buick's lease penetration hovered around 15 percent. That's below the industry average of around 22 percent and far lower than the brands Buick is targeting, such as Acura, Lincoln and Infiniti, whose lease penetrations range from 35 percent to higher than half of sales. Leasing virtually dried up for GM dealers during the 2008-09 financial crisis. Buick-GMC dealers had been stuck trying to sell Buicks with monthly lease payments that were higher than rivals' in the entry-luxury category, where competitive lease payments are crucial for success. That was especially painful in lease-heavy markets such as the Northeast, where lease rates can exceed 40 percent for sedans. Now Buick is advertising a 24-month lease on an Enclave for no money down and $433 per month, including the maintenance, satellite radio and OnStar. That's $20 cheaper than a 39-month lease with no freebies that Buick had offered before. In contrast, buyers can get a 36-month lease on an Acura MDX SUV for $449 per month plus $2,999 down. "They were missing the boat, and they realized it," Cappellino says. Greg Heath, a vice president at Mark Christopher Auto Center in Ontario, Calif., said better lease deals helped drive his Buick sales up to 15 units in April, from an average of three or four in previous months. But Heath, whose store got the Buick franchise in 2009, says he needs 25 sales a month to get a decent return on investment. "If the product were crappy, I'd say, 'This is going to be a long battle,'" Heath says. "But the product is good. And now these lease payments are phenomenal. "If we don't see Buick sales go up with what we're throwing into the marketplace right now," he says, "then shame on us."